Merry Chirstmas and Happy Holidays! We have a shorter cast this time, but based on a wintery and Christmasy theme. This theme was a little more difficult to find within Zelda, but we managed to figure some things out for you. We would like to thank Shariq “Sharky” Ansari very much for the background music used in today’s podcast. You can see all of Shariq’s work at Darkesword. What do you think? Is Axle right? Did you think the winter Dungeons were hard? Are the –fos enemies all related? What do you think Santa would bring your favorite Zelda Character for Christmas? The twelve days of Christmas song lists collectibles from all the Zelda games, can you tell us what game each of them are from? But remember, it has to be in that number! Write it in the comments section below! 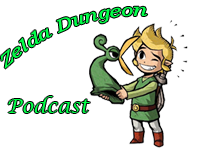 Once again, Merry Christmas, Happy Holidays, and Happy New Year from everyone here at Zelda Dungeon.